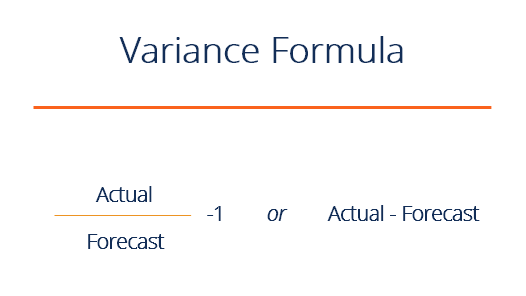 The variance formula is used to calculate the difference between a forecast and the actual result. The variance can be expressed as a percentage or an integer (dollar value or the number of units). Variance analysis and the variance formula play an important role in corporate financial planning and analysisJobsBrowse job descriptions: requirements and skills for job postings in investment banking, equity research, treasury, FP&A, corporate finance, accounting and other areas of finance. These job descriptions have been compiled by taking the most common lists of skills, requirement, education, experience and other (FP&A) to help evaluate results and make informed decisions for the business going forward. What is the Variance Formula? In the following paragraphs, we will break down each of the formulas in more detail. As the name implies, the percent variance formula calculates the percentage difference between a forecast and an actual result. In the example analysis above we see that the revenue forecast was $150,000 and the actual result was $165,721. Therefore, we take $165,721 divided by $150,000 less one and express that number as a percentage, which is 10.5%. This is an example of an outperformance, a positive variance or a favorable variance. The formula for dollar variance is even simpler, it’s equal to the actual result subtracted from the forecast number. If the units are dollars, this gives us the dollar variance. This formula can also work for the number of units or any other type of integer. In the same example as above, revenue forecast was $150,000 and the actual result was $165,721. We now take $165,721 and subtract $150,000 to get a variance of $15,721. Since variance analysis is performed on both revenues and expenses, it’s important to carefully distinguish between a positive or negative impact. For this reason, instead of saying positive, negative, over or under, the terms favorable and unfavorable are used, as they clearly make the point. For example, if a cost has a negative difference to the forecast (lower than expected), that’s a favorable variance since it’s better to have costs lower rather than higher. The variance formula is useful in budgeting and forecasting when analyzing results. The job of a financial analyst is to measure results, compare them to the budget/forecast, and explain what caused any difference. In the Financial Planning & Analysis department at a company, the role of FP&AJobsBrowse job descriptions: requirements and skills for job postings in investment banking, equity research, treasury, FP&A, corporate finance, accounting and other areas of finance. These job descriptions have been compiled by taking the most common lists of skills, requirement, education, experience and other is to present management with accurate, timely, and insightful information so they can make effective decisions about the business going forward. Using the variance formula and presenting this type of information is critical in FP&A.